How well do you know Wood Badge? Take this quiz and test your knowledge. It is 50 questions long but it won't take you any time if you've done your homework. There may be a couple of questions that are specific to the courses in the Greater Alabama Council. Give yourself credit for those if you are in another council. Good luck! 1. Who started the Wood Badge Course in 1919? 2. What is Wood Badge? 3. Where are the other Gilwells located? 4. What Clan is the tarten that is on the back of the Wood Badge neckerchief? 6. What is the significance to Wood Badgers of the necklace B-P captured? 7. What knot is used to tie a woggle? 8. 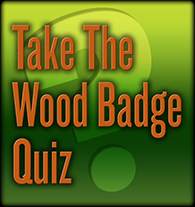 How many beads does a Wood Badge participant wear? 9. How many beads does a Wood Badge participant who completes all 5 goals of their ticket wear? 10. How many beads does a Wood Badge Staffer wear? 11. How many beads does the Scoutmaster on the course wear? 12. How many beads did Baden-Powell wear? 13. What is the totem of Gilwell Park? 16. Who was the first American Wood Badge Scoutmaster? 18. Why are your 5 goals called a ticket? Refers to British soldiers buying their tickets home after their military service was completed. 21. What did Dr. James E. West, America's first Chief Scout Executive, define as the three things Scouting needed most. 23. Where was the first American Wood Badge course held? 24. Where was the second Wood Badge course held? Hint: It was held the same year as the first course. 26. What were the first four American Patrols? 27. What is significant about those critters? 28. What additional critters were added later? 29. Which is the correct Wood Badge order. Also know as critter order. 30. What song was introduced to mention the patrols? 31. What is the third flag at Gilwell? 32. What is the original symbol used by the Program Patrol? 33. What symbol is used by the Service Patrol? 34. What is the last item of the day before taps? 36. What year did the BSA approve attendance of women in Wood Badge? 38. What is the main job of the patrol scribe? 39. What does the Quartermaster do? There was a quartermaster on staff? 41. What is a patrol totem? 42. The Scoutmaster minute should be how long? 43. What do we mean when we say your ticket should be SMART? 44. What does EDGE stand for? 45. What is the correct order? 47. What entire movie was shown on Wood Badge in the 21st Century courses? 48. Where are Beavers, Beavers, Beavers wielding rusty cleavers? 49. How long do you have to finish your goals, write your completion form and have your ticket approved?